Provided by the publisher for review through NetGalley. All opinions are my own. I remember, as a child, thinking that adults just didn't get it. I had my own rules, I knew what was right and wrong, everything was black and white. Lester's like that. He is the keeper of his own world. He keeps everything in order. But Cousin Clara knows nothing of order. She makes dreadful sweaters, that don't go with his tie and cover up his perfectly slicked hair. She messes up all the order in his world, and his parents are her enablers. He does what he can to get rid of the offending items but they keep coming back- until he finds people who can appreciate her gifts for what they are. 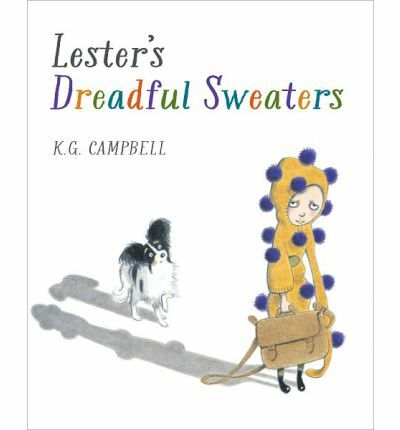 Lester's Dreadful Sweaters is a peculiarly British-sounding book full of eccentrics, none so much as the fastidious and lovable Lester. The retro grammar school feel extends to both text and illustrations, and reminds me as much of The Cat In The Hat with its uninvited guest as it does of Adrian Mole. The unbelievably odd combinations of sweaters give the reader quite a few giggles. Definitely an exciting debut for a picture book creator!